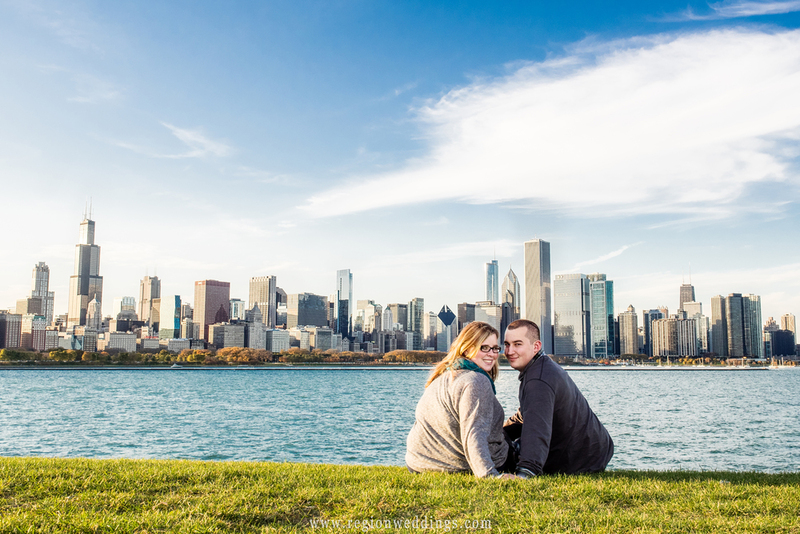 A cityscape engagement photo of downtown Chicago. I will be photographing their wedding next October and since Michelle regularly attends events at the Chicago Theater, it was only right to get some images there along with other gritty parts of downtown such as alleys and some hotel hollywood lighting as well. 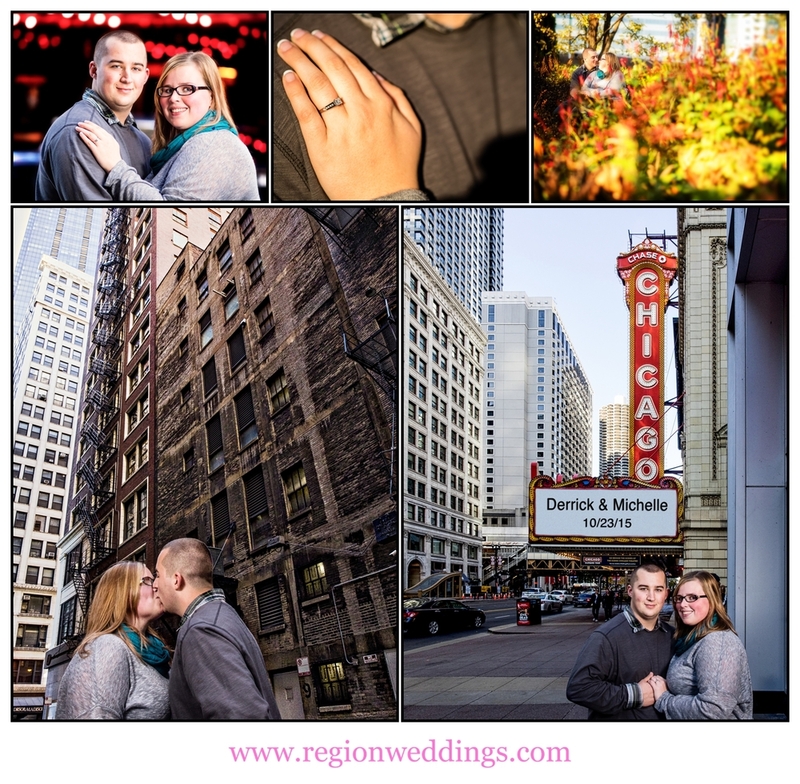 A photo collage of engagement photos in downtown Chicago. While I always try to capture romanticism in my engagement photos and cute and fun are always good too, I like to do different as well. As we were walking along the Lake Michigan shore I saw the dramatic sky behind the Adler building and placed the happy couple up on the ledge and let them hang out for awhile. I loved the blue tone reflected in the windows from the sky and the water. I also love their wonderful smiles as well. A cute couple hangs out behind the Adler Planetarium in Chicago. This October has been the busiest month for engagement sessions that I have ever had and many more engagement and wedding sneak peeks to come. If you would like to learn more about this type of Chicago Engagement Session or to inquire about availability for your wedding date, please fill out the Contact Form today. Stay tuned to this page for more image updates as well. 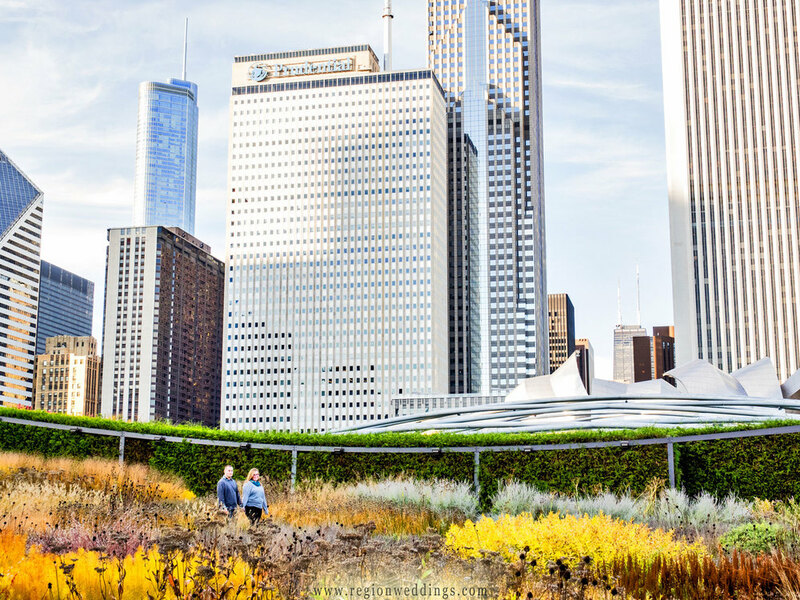 City skyscrapers as seen from the Millennium Gardens in this Chicago engagement photo.